Yesterday we went on another wild-goose chase. [An earlier one can be found here, and strike me pink if it doesn’t start with exactly the same sentence!] Since I am the instigator and the planner of these expeditions, I am hoping I don’t make a habit of this. Or else, the L & M is going to put his large foot down and refuse to budge on future expeditions. Of course, it is never intentional that the chase go wild. I had a definite place in mind, but it eluded us. That’s what happens when the place is question is not well known enough to have people flocking to it. It also means that the roads are bound to be bad, and they really were bad, I tell you! No matter. In between, I chanced upon a beautiful spot swarming with egrets and we stopped so I could take a few pictures. Hmm.. May be I should rename our drive a ‘wild-egret chase’, a successful one at that. So pretty! I love the palm trees, too! What a beautiful photo of a beautiful place. Sometimes drives that end up being different than expected can be just as much fun, if not more. I agree. Veering off the usual paths is rather fun 🙂 Thank you! Saw your lovely photos on Facebook! 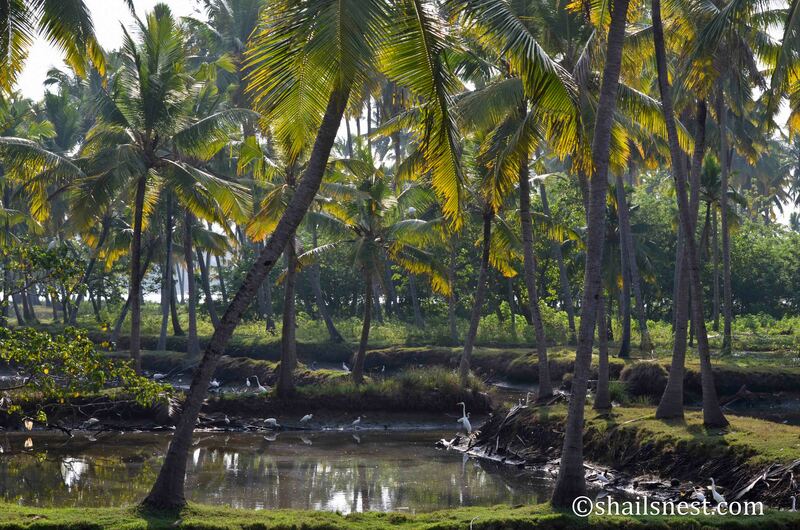 Egrets or crows, the picture is lovely, Shail! It must be ‘feel good’ drives! continue…L & M is always with you! Does destiny determine our destination? All said and done the photo deserves an appreciation. Phew. The last sentence wasn’t too complicated for me to understand 😛 😀 Thanks, Govind. Thank God for small mercies! Lol. If you turn a little philosophical, the first 3 lines would also make sense. I think. Don’t worry, I got those lines too. I was just pulling your leg. Oh I thought philosophy comes to people like me who are bruised and battered in life, and not to people born with the silver spoon. Govinda, govinda! Mounam vidwanu bhooshanam ennanallo. Pakshe ivide, mounam Shail-nte eka raksha margam! Gemininans! Sometimes where you end up is even better than where you were going.